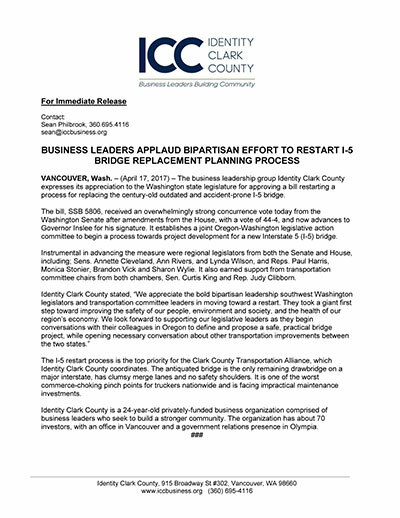 The business leadership group Identity Clark County expresses its appreciation to the Washington state legislature for approving a bill restarting a process for replacing the century-old outdated and accident-prone I-5 bridge. The bill, SSB 5806, received an overwhelmingly strong concurrence vote today from the Washington Senate after amendments from the House, with a vote of 44-4, and now advances to Governor Inslee for his signature. It establishes a joint Oregon-Washington legislative action committee to begin a process towards project development for a new Interstate 5 (I-5) bridge. Instrumental in advancing the measure were regional legislators from both the Senate and House, including; Sens. Annette Cleveland, Ann Rivers, and Lynda Wilson, and Reps. Paul Harris, Monica Stonier, Brandon Vick and Sharon Wylie. It also earned support from transportation committee chairs from both chambers, Sen. Curtis King and Rep. Judy Clibborn. The I-5 restart process is the top priority for the Clark County Transportation Alliance, which Identity Clark County coordinates. The antiquated bridge is the only remaining drawbridge on a major interstate, has clumsy merge lanes and no safety shoulders. It is one of the worst commerce-choking pinch points for truckers nationwide and is facing impractical maintenance investments.